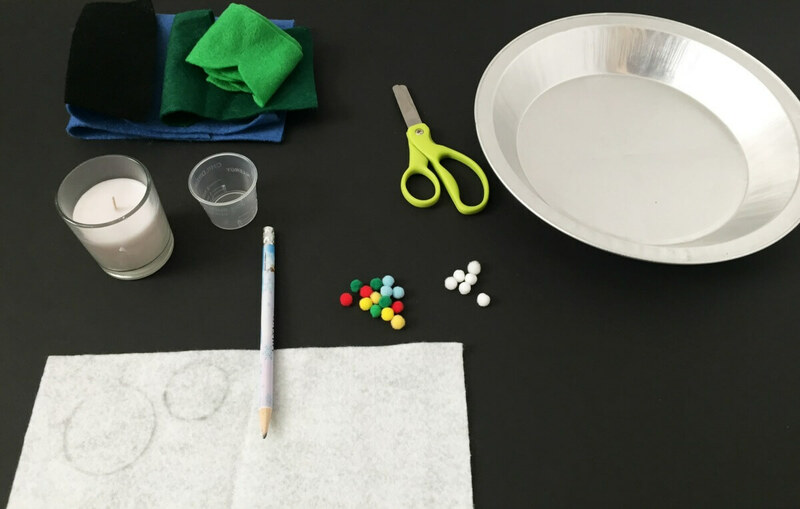 You are here: Home / 2 years old / Make a Snow Globe Craft with the Kids from Recycled Materials! 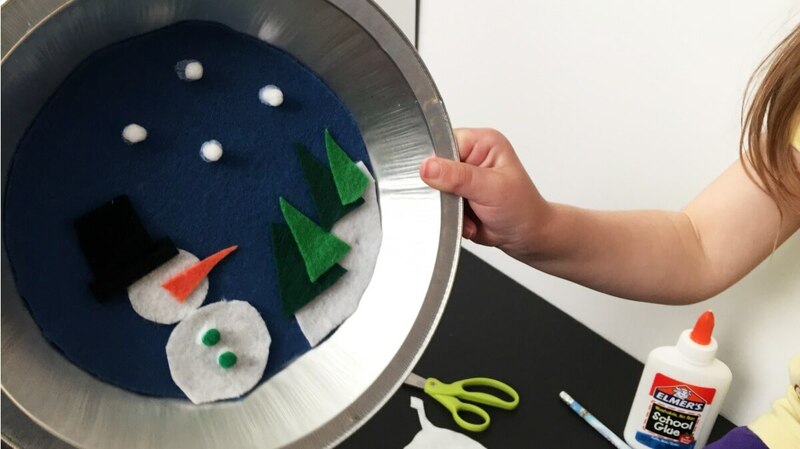 Make a Snow Globe Craft with the Kids from Recycled Materials! 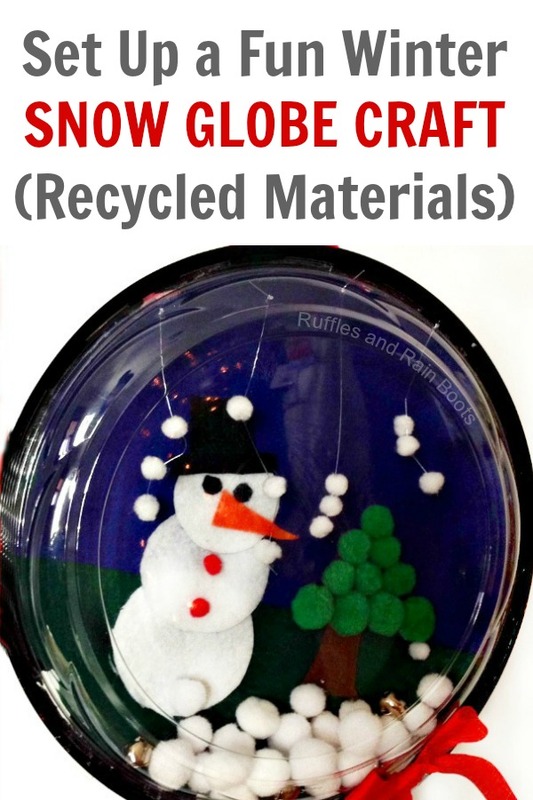 This snow globe craft is so much fun for kids and it uses recycled materials and scraps. You likely have everything you need for this craft on hand, so let’s get started with a bit of winter and holiday crafting! Note: this post was originally published in 2013 but has been updated with new images. 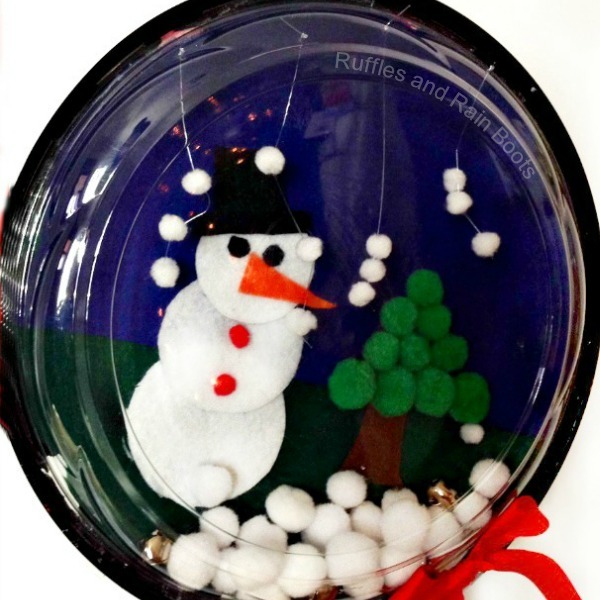 We’ve also included a snow globe craft for kids version (great for ages 3-5). Waking up to snow in Seattle is a rare occurrence. 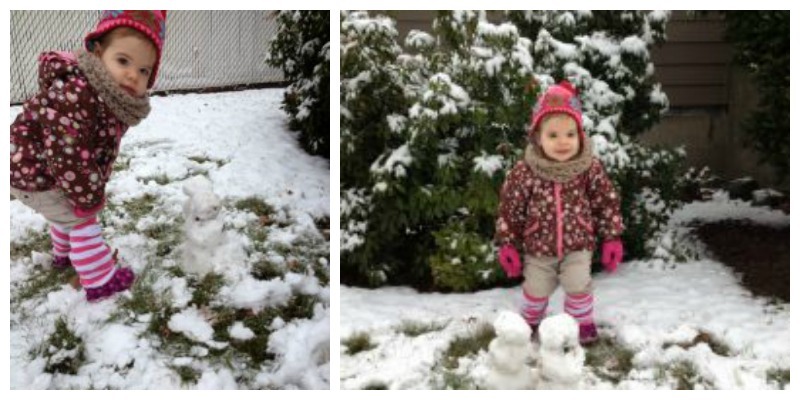 The little one wanted to build a snowman but there was only just a little snow! So we brainstormed with what we had on hand and came up with this adorable snow globe craft made from a recycled pie plate and pie protector! This is a great craft when talking about recycling because we are repurposing a pie tin and pie protector for this project. We’re also using scrap felt and well, just about anything you have on hand! This project can be made two ways: for the kids or by the kids. The original snow globe above was made FOR the kids. The one below is made BY the kids. It’s such a fun and versatile holiday and winter craft! 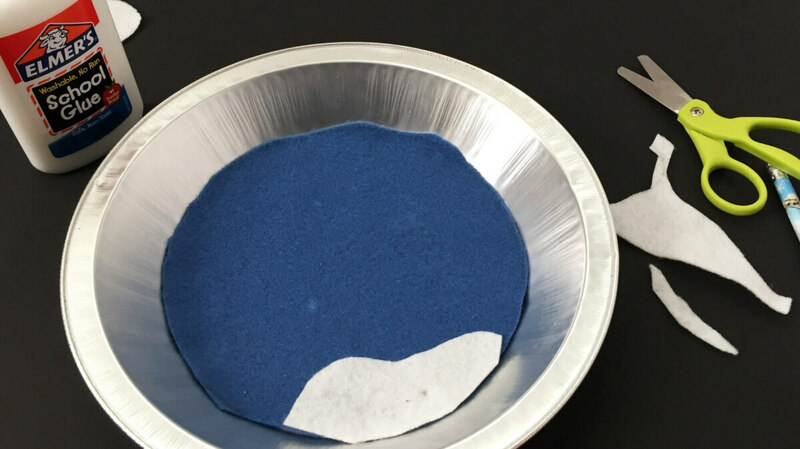 Step 1: Use glue and affix the blue (sky) and green (hill) felt, followed by the snowman and tree trunk all to the bottom of the pie protector or pie plate. If the kids are doing the craft, let them cut out a pile of snow and decide where they want. Next, they’ll cut out two circles for a snowman and glue it down. Step 2: If you’re doing this FOR the kids, glue down the pompoms to make the tree – this is probably one of my daughter’s favorite parts of this craft. If the kids are taking over, allow them to cut out scraps of felt in the shapes of trees and glue them down. Step 3: Add the white pompoms at the bottom but do not glue. We left those and the jingle bells loose for a sensory aspect to our snow globe craft. Step 4, A (optional): String miniature pompoms through the fishing wire and pierce through the top of the pie protector. Tie them off so they hang down. Step 4, B (optional): If you want the kids to do this project themselves, allow them to glue down the miniature pompoms to the blue felt instead of stringing them on fishing line. Step 5: Add a bit of glue and attach the top of the pie protector to the bottom. Attach the ribbon to the back with the duct tape and you’re done! 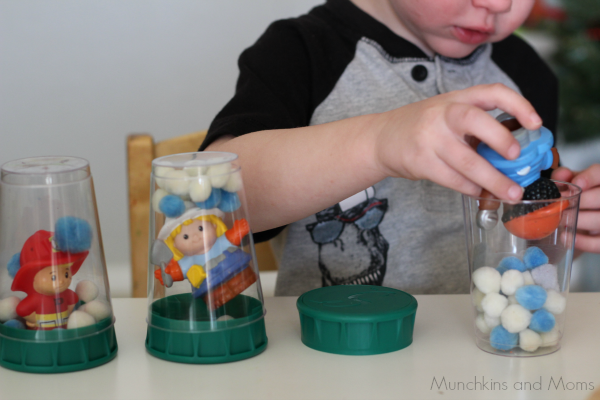 If you’re looking for an activity for many kids, set up this simple toddler snow globe craft. It’s adorable and the kids will have so much fun creating a few of their very own snow globes without water. 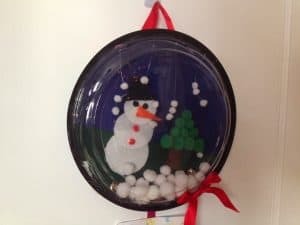 How did you like our recycled snow globe craft? We sure had fun making it and it comes out every year. I’m updating this in 2018 and we first made it in 2014! Each year, my daughter wants it hung on her bedroom door and I am happy to comply. I loved this post … I nay have to buy a pie so I can make a snowman globe for next year here in Panama!